Its been so long since I dropped a recipe, so I decided to bring something special this time. It’s a simple process on how to make carrot juice. Yeah, carrots! When I heard it at first I was shocked but I was amazed after I tasted it. 1. The iron in carrot: Drinking carrot juice equips you with iron. Iron has a lot of advantages in your lifestyle and health. It not only helps in elongation of energy, but also gives rise to a component of the red blood cells which rations your tissues with oxygen. The accurate measurements describe that 1-cup of carrot juice encloses 1.1 milligrams of iron, therefore it is advisable to consume 6% of carrot juice daily for pre-menopausal women and men, and about 14% is endorsed daily for post-menopausal women and men. 2. Vitamins A and K in carrot: Carrot is a great source of vitamin A, only one cup of carrot juice has 45,133 international units of vitamin A. This vitamin provides a healthy eye function, and it allows the cells to rule the gene activity and plays a targeted role in immune system. Vitamin K on the other hand is a nutrient needed for the health of the bone and blood clotting. 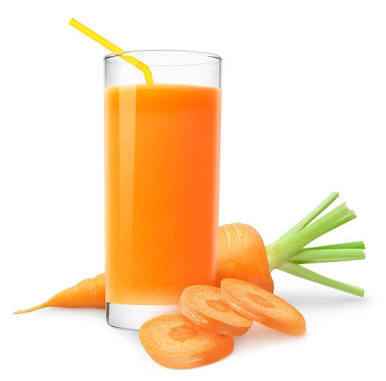 Each drop of carrot juice contains 37 micrograms of vitamin K! 30% and 40% is the recommendation for daily consumption for men and women, respectively. 1. Wash and dice the carrots. 2. Put them inside the blender. 3. Add a small amount of water. 4. Blend with a medium speed until the ingredients are well mixed. 5. Place a sieve bag in your desired cup/container and pour in the blended ingredients. 6. Squeeze as much liquid out of the sieve bag as possible. 7. Add anything else that will suit your taste (for me, I add a little honey/sugar and some milk). 8. Place in a refrigerator (if you want it chill). 9. Serve alone or with any dessert. Awesome!!! This looks very healthy! Pls, what if i want to go on a large scale production, how can i preserve it in such a way that it will loose taste? Thank you. Hello Vic, remember that fresh carrot juice is best served immediately after preparation! But in a case where you want it to last longer, you can put it in a freezer. this preservation can only last a day or two.. anything more than that will you a taste you wont like... you can try adding artificial preservatives but you may still not get the taste u want after that. my advice, prepare and serve within a day of consumption!